Office parties—when the staff lets their hair down, the boss awkwardly pretends to be “one of the gang”, and at least one person gets embarrassingly drunk—are a staple of the corporate world. These days, such events are limp, pathetic affairs, attended with the same enthusiasm as your average dental cleaning. Last week, during one of my periodic sweeps of the Google book archive, I came across a tantalizing snippet of an article from Pencil Points magazine referring to a “Sketch no. 8, Doings in the Hive of the Three Busy B’s, Betelle, Bauer, Behee”. If this was a drawing of the men in their office it would be a great find, as no photos like that have turned up. Well, it ended up not being a reference to an artistic sketch, but rather a theatrical one—as part of an elaborate office party. The soiree was held on the evening of February 18, 1922, and apparently nautical themed (“all hands”, “Pilot of the Ship”, etc.). Written in the playfully satiric tone of a drafting room insider, the article gives a tangible feel for these people, at a time when an office party was not only well regarded, but put together with zeal, humor and sincerity. Just the image of Betelle — “Jimmy” — dancing with the ladies into the “wee sma’ hours of the morning” is priceless. A get-together party which was so great a success that it will undoubtedly be followed by other occasions of a similar nature, was held on the evening of February 18 by the office force of Guilbert & Betelle, Architects, Newark, N.J. The purpose was to foster a spirit of co-operation and good fellowship between the members of the firm and the members of the office force, also among the men themselves. At twelve o’clock noon all hands turned to and cleared one of the large drafting rooms of drafting tables, horses and the instruments of torture. The various committees attended by the nouveaus bearing crêpe paper, table covers, pots of paste, nails, etc., proceeded to decorate the room and erect the “amphitheater” and stage. Palms and flowers were then arranged about the room to complete the transformation. The other drafting rooms and offices were turned into cloak room, smoking room, refreshment emporium, etc. A feature of this program that brought great applause was “In the Hive of the Three Busy B’s,” by Fred A. Elsasser, Girard Lindsley, Robert J. Sands and John T. Ferriss. In this sketch the members of the firm, James O. Betelle, Charles Bauer and Grant A. C. Behee were caricatured. “The Force,” a duet, the words of which were written by Fred Kuchler, was made up of amusing verses about the various members of the office force, and caused much merriment. After the rendering of the program there was dancing into the “wee sma’” hours of the morning, during which “Jimmy” made it a point to dance with every lady, one of the ways in which he showed his good fellowship and hearty co-operation in making the party a success. The April, 1915 issue of The School-Arts Magazine (“For Those Interested in Drawing & Handicraft”) ran a flowery piece, “Something Beautiful”, extolling the “rhythmic and refined” qualities of the Ridge Street School and Newark Normal School. Preceding the glowing praise are quotes from Ralph Adams Cram, “architect of some of the finest Gothic churches in America” (and notably the campus of Princeton University). Edited portions below. 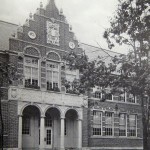 Those who had charge of the building of the Ridge School, and of the State Normal School, Newark, N. J., evidently agreed with Mr. Cramm as to the influence of good architecture, and secured architects who could produce it. The initial illustration shows the inviting entrance to the Ridge School. How rhythmic it is! Three stories high, the features of each are in a triple group: steps, columns, arches; tablet, windows, transoms; lunnettes, ornaments, crown. Then, reading horizontally; the features are in threes again: three entrance arches, three windows, three groups of ornament. How refined it all is! “Nothing too much” as the Greeks used to say. 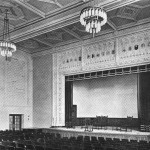 The other shows the stage in the Auditorium of the State Normal School, Newark, N. J. Again notice the rhythmic sub-divisions into thirds both ways. Notice also that all the prominent lines are vertical and horizontal. The result is a design refined and rich yet unobtrusive, as the frame for a stage should be. Guilbert & Betelle, of Newark, N. J., were the architects to whom our thanks and congratulations are due for adding to the beauty of the world. Marcia Worth of Patch, a local community portal, has written a nice piece on Montrose School in South Orange, New Jersey. Montrose is a rather unique design for the town and a sentimental favorite of mine.